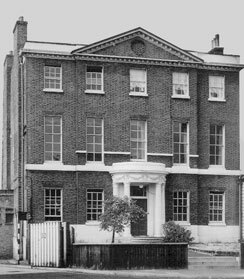 Brunswick House (30 Wandsworth Road) was built by John Dawson in 1758 on about three acres of freehold land bought by his late uncle Richard Dawson in 1737 from Joseph Pratt. Originally called Belmont House, presumably after the southern boundary road then called Belmont Row or Place (now Nine Elms Lane), this three-storey grade II* listed building is roughly square in plan. The plot contained the mansion house, offices, a coach-house and stable. The Nine Elms Lane face has a central feature projecting slightly from narrow flanks, one window wide. This feature is three windows wide and topped by a triangular pediment with a circular brick motif. In the middle of the ground floor of this feature is a semi-elliptical, central porch. The porch is mounted on a couple of steps with two free standing fluted double columns with moulded bases and capped in a water-leaf design. Above the columns is a moulded frieze of rams’ skulls linked by floral festoons. This porch is possibly a later addition and is thought to contains Coade’s artificial stone parts. Built of red stock brick the building has horizontal white painted stone bands at ground and first floor level with a crowning cornice of similar stone. The windows have a stone sill and the first floor ones on the Nine Elms Lane face have probably been lengthened. There is little of interest to the sides and the River face is relatively plain with three stories of five equally-spaced windows and repeats some of the white stonework decorations of the road front. 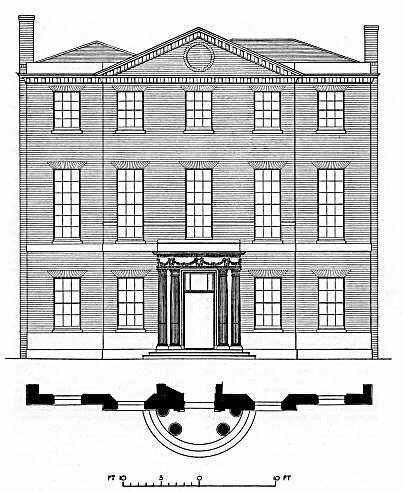 In 1791 the house was divided into two; the larger south-western portion was leased to David Hunter and the other to William Anderson. Hunter’s half was sold to the Western Gas Company in 1845 and subsequently to the London and South Western Railway Company in 1854. In 1811 Anderson’s half was purchased by Friedrich Wilhelm, Duke of Brunswick, who fled to England after taking part in the battle of Wagram against Napoleon but returned to Brunswick in 1813 and was killed in battle two years later. His part of Belmont House was purchased by the Gas Company and sold to the Railway Company in 1855. The two parts of the house were subsequently reunited under the name of Brunswick House and was used as an institute and club for railway workers. Over the years most of the interior features of the building have been lost or damaged. However, the building is now owned by Lassco, an architectural salvage company, who have restored much of it.